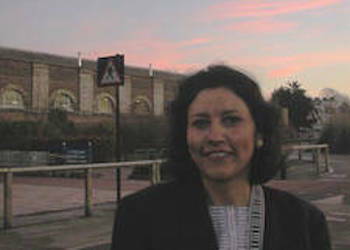 Luz Rodriguez was awarded a scholarship to complete a BA(Hons) in Fine and Decorative Art, MA in Art Business and MA in Fine and Decorative Art at Sotheby’s Institute of Art in London, and has since completed a Postgraduate Diploma in Asian Art at the British Museum, taking the courses on India, China and Islam and a further MA in Art and Archaeology from SOAS, University of London. In her career as an independent scholar and cataloguer for Sothebys, she has catalogued antique oriental carpets and 19th-20th century Japanese wood-prints, worked as keyword editor for the Index Islamicus Journal, edited two books in Spanish and worked in translation from English into Spanish of the book ‘Islamic Art’ by Dr. Barbara Brend. Ms Rodriguez also wrote an article about ‘The Zafarnameh’ (The Life of Timur) written by the Persian historian Sharaf al- Din ‘Ali Yazdi, which was presented on a travel grant also awarded the Soudavar Memorial Foundation. The article has been published by the University of Salamanca (Spain). As an art researcher specialising in Persian and Indian miniature paintings, she is currently working with Persian manuscripts from the 16th and 17th centuries that found their way into India and were altered in Indian workshops before being brought to England. Close scrutiny of these manuscripts, with both the application of new technologies and the customary methods of art-historical research have resulted in new findings that have important implications for our understanding of the subject under review. In July-August 2015 Luz received a supplementary grant from the Soudavar Memorial Foundation for travel to Iran to study Persian language at the Dehkhoda Institute and to view and study other similar manuscripts in Iranian collections. grant was awarded for x-ray and multi-spectral imaging of a selection of Persian manuscripts in the collection of the British Library. Report: Currently I am working with Persian manuscripts from the 16th and 17th centuries that found their way into India and were altered in Indian workshops before being brought to England. My close scrutiny of these manuscripts, using new technologies alongside customary methods of art-historical research, has resulted in new findings with important implications for our understanding of this subject. I carry out research into the construction of a manuscript, based on the object itself. In my research I use X-ray fluorescence (XRF) to identify elements present in the pigments, particularly those that are mineral/inorganic. The other technique I chose is multi-spectral imaging (MSI). This technique allows similar coloured materials to be easily distinguished, helping to determine aspects vital to the research: such as the order in which colours were applied and the presence of under-drawings. Fort Photonics ‘MuSIS HS’ for multi-spectral imaging. My research is groundbreaking in its use of forensic techniques. These have been used extensively in the analysis and understanding of European art, however they have not previously been applied to Persian manuscripts in this way. Until now cataloguing has mostly been based on visual and written evidence. I compare my findings with original treatises on manuscripts, especially 16th, 17th and 18th centuries which allow me to collate present day scientific reports, my stylistic knowledge and contemporary accounts. As a result I can differentiate original Persian paintings from any Indian alterations, and to decide if the manuscript is one original document or made from various different manuscripts.